It's been a couple months since I was able to sample something new from our friends at Chewy.com, but when my January email arrived and I saw the Friskies Lil' Soups with Tuna in a Velvety Chicken Broth Lickable Cat Treats listed, I demanded that Mommy order some for me. A few different times she saw them advertised in the Sunday paper's coupon section, but somehow always "forgot" to pick up a few cups when she went to the grocery store. She knows that I prefer my wet food as "soupy" as possible, so I just can't understand how she could forget such a thing! Made with real tuna and real, wholesome ingredients you want to give your feline friend. Velvety broth adds delicious flavor to every bite and entices even picky eaters. Packaged in a convenient cup for effortless serving, so you can spend less time scooping and more quality time with your kitty. Intended as a complement to your adult cat's complete and balanced diet or a delicious treat after mealtime. This enticing snack is the purrfect way to get the attention of your adult cat. Look at me slurping it up! So what did this fussy little tortie think of the food? I love, love, loved it! As a matter of fact, it nearly made me a member of the clean plate club, which has pretty much never happened! 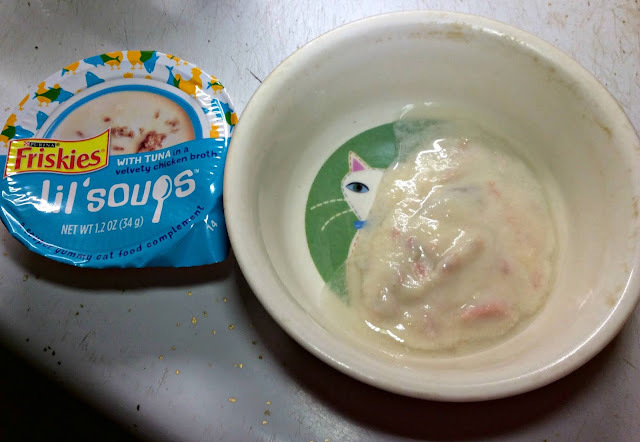 It's super yummy and yes, soupy, just the way I like it, and Mommy loves that it adds extra moisture to my diet since I'm such a kibble addict. She also appreciates the completely mess-free cups. I can definitely see myself noshing on these long-term along with the other recipes of shrimp, sockeye salmon, and chicken and butternut squash. The Lil' Soups are currently on sale at Chewy for $7.50 for 8 1.2 ounce cups. Chewy offers FREE 1-2 day shipping for orders over $49, and with over 500 brands in stock they have something sure to make every cat or dog happy. Tell them Mudpie sent you! Disclaimer: We received product compensation from Chewy.com as part of their Blogger Outreach Program in exchange for an honest review. All opinions are our own and we never recommend a product we don’t fully believe in. That does look like it's pretty darn good and I'm glad you approve sweet Mudpie! Maybe you can pull the lid off, and drop the cup into the cat bowl! Wonder if Da Boyz would like something like that? Great review. This was a hit here too, the chicken and salmon. Mudpie, it looks like a winner - I like the 'comes with it's own bowl' aspect too. Mmmmm. Especially with your rave review of it, Mudpie, the kitties here really need to try this food out. They generally like Friskies canned food, at least usually, sometimes. So, maybe they would love this! Happy snacking! Mudpie, it looks like a winner to us. We are going to give it a try with our two little furbabies at home. Thanks for sharing your review. We always enjoy your posts. Have a great one. It certainly looks as though you love them Mudpie! We are just dropping by to say , hello! And to let you both know (you and your Mama) that we think of you and hope all is well with you both! Hugs to you, sweet friends! Glad you liked 'em too, MP. Did you get any on your nose? TW cut the coupons which expired and we still haven't seen them in either of our supermarkets. Soup is good food, eh Mudpie? Sounds like this is good! I keep reading that cats like it.